He's 2nd from the left on the front row. My grandfather was standing two rows behind him (not seen in this photo). I think this photo was taken after the final war patrol of the USS Tambor (SS-198). Ben Hynum was on the Tambor for the last couple of patrols as a radio operator, as well as a sonar and radar operator, and was a .50 caliber gunner in surface attacks. He has lots of cool stories to share. Ben is a really nice guy. I got to talk with him for a little while. Rick and Correy spent a lot of time with him. He got to see the artifacts that were found in the tubes. Mr. Hynum was as happy as a kid in a candy store. He looked around for quite a while Saturday with a constant grin and kept exclaiming that he'd never seen anything like what we were doing. THIS...THIS is why we do living history. We want to educate the public and bring the boat back to life. He kept exclaiming "This just brings back so many memories". I hope to spend more time talking to him in the future. 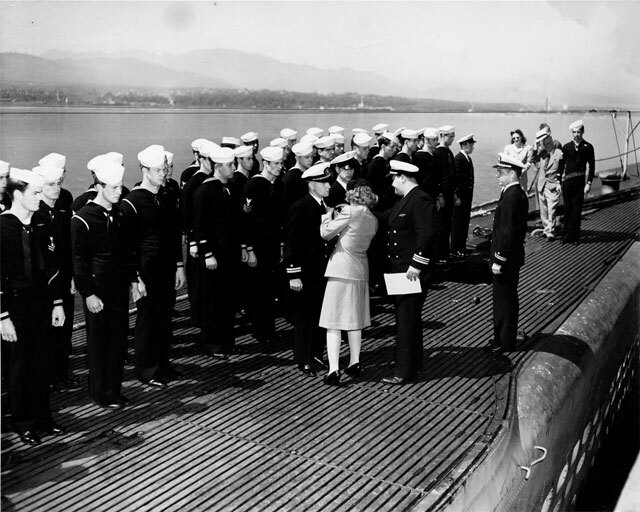 Also at the boat were crewmembers from other vessels including the Proteus, the sub tender that more than once, serviced the Batfish and her sisters...AND was present in Tokyo bay during the surrender. I don't know who had more fun...us or the veterans! Awesome guys, just awesome. Thank you so much! friend, for which I am extremely grateful. Hopefully, he'll make a habit of coming down, like Nick and the other "local" vets. I had the pleasure to talke with Mr Hynum very briefly. I was pulled away to interview on the find the the torpedo tubes. Thank you to everyone for all of their efforts. My mom has known and worked with Ben since the early 80s. She has told him about the Batfish and the BLHA for the last year and he kept saying he wanted to get down there during an event sometime. She said he is always coming into the newspaper, where she works, and talking about this or that...Here sometime soon I'm going to go out for lunch with him and spend the day listening to and writing down some of his sub stories. Any specific questions anyone wants me to ask him? Ask him about wearing a ring while sliding down a ladder when doing a crash dive.